It is not often that I have a driving road-trip with friends, and it was by a stroke of luck that I had managed to get two friends to join me on a short part of my Norway trip - the Lofoten islands. The Lofoten is an archipelago well beyond north of the Arctic Circle, and is famed for its natural beauty of mountains, seas, bays and islets. In summer, it is popular for hiking as well as boat trips and water-based activities. In winter, things die down quite a bit though, with alot of tourist facilities closing or operating at very limited hours. However, it is a wonderful location for Aurora hunting. In addition, the winter scenery is just phenomenally spectacular. and so appreciating it on your own terms in your own transport is probably the best bet. The easiest and fastest way to the Lofoten is flying into Svolvaer, the administrative centre for most of the Lofoten. My friends flew in (from Oslo) and by their accounts, the flight in was absolutely beautiful. I flew from Oslo to Narvik (on mainland Norway) instead, on Norwegian, a low-cost airline, and then took a bus in. 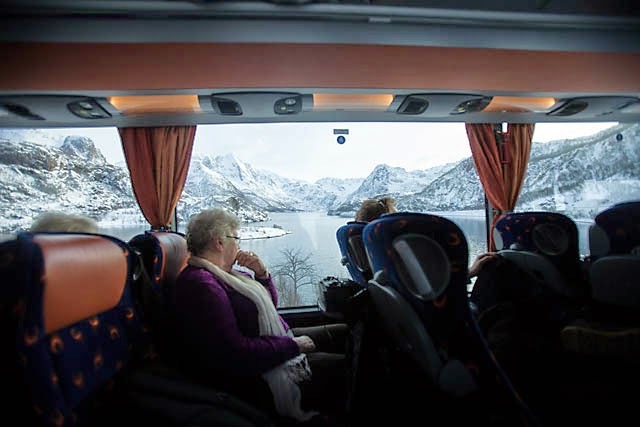 The bus journey to Svolvaer to meet my friends had me glued to the window already. For those who prefer to do overland travel from Oslo, you can take the train from Oslo to Bodo, and then take a ferry. Finally, if you find yourself in Kiruna Sweden, getting to Lofoten is also easy. Get onto the Arctic Circle Train, and then bus in. You'll be spell-bound on all segments of your journey! Will be going in mid july....solo. Will start from Oslo(overnight ferry from copenhagen) by flight to lofoten. Which part of lofoten should i stay for the best summer scenery ..etc? Hope i can get some good tips from you. As for the Lofoten, I went in winter, so also can't comment on summer scenery. However, Reine is quite well-known for its pictureque setting, and in winter, its beautiful, I'm sure summer it is as well. I agreed totally, Lofoten is hands down the most beautiful fishing village in the world. I was there in 2013 hope to revisit the lovely island again. I, too, hope to revisit Lofoten again, hopefully in summer! I guess summer would be great as hiking becomes possible but however, most likely I will be back there around winter/spring again cos I really like Lofoten in snow and less crowded? I barely see any other tourist other than myself, almost free to roam anywhere I like. Ya...not much choices to eat and hike but it's ok for me I guess, since I was busy taking photo all the time! But I did buy quite a bit of bread and stuffs before departing from Oslo to Lofoten knowing most places will be closed. I didn't manage to catch Northern Lights in Lofoten as it was almost Spring when I was there, so I made that up by seeing it in Iceland last year and Canada this year.